The basic value proposition of Essentialism: only once you give yourself permission to stop trying to do it all, to stop saying yes to everyone, can you make your highest contribution towards the things that really matter. Dieter’s design criteria can be summarized by a characteristically succinct principle, captured in just three German words: Weniger aber besser. The English translation is: Less but better. A more fitting definition of Essentialism would be hard to come by. In many cases we can learn to make one-time decisions that make a thousand future decisions so we don’t exhaust ourselves asking the same questions again and again. The way of the Essentialist means living by design, not by default. What if schools eliminated busywork and replaced it with important projects that made a difference to the whole community? What if all students had time to think about their highest contribution to their future so that when they left high school they were not just starting on the race to nowhere? It was a classic “straddled strategy” of attempting to invest in everything at once. The result was that while I was not entirely failing in any pursuit I was not entirely succeeding at any either. Is there a point at which doing more does not produce more? Is there a point at which doing less (but thinking more) will actually produce better outcomes? Think of Warren Buffett, who has famously said, “Our investment philosophy borders on lethargy.” He and his firm make relatively few investments and keep them for a long time. In The Tao of Warren Buffett: “Warren decided early in his career it would be impossible for him to make hundreds of right investment decisions, so he decided that he would invest only in the businesses that he was absolutely sure of, and then bet heavily on them. He owes 90% of his wealth to just ten investments. Sometimes what you don’t do is just as important as what you do.” In short, he makes big bets on the essential few investment opportunities and says no to the many merely good ones. Jim Collins was once told by Peter Drucker that he could either build a great company or build great ideas but not both. Jim chose ideas. As a result of this trade-off there are still only three full-time employees in his company, yet his ideas have reached tens of millions of people through his writing. To that end, the school has also created a hiding place called “Booth Noir.” This is a small room deliberately designed to fit only one to three people. It is windowless, soundproof, and deliberately free of distraction. It is, according to Scott Doorley and Scott Witthoft in their book Make Space, “beyond low-tech. It’s no tech.” It’s tucked away on the ground floor. It is not, as Doorley and Witthoft point out, on the way to anywhere else. The only reason you go there is to think. By creating space to think and focus, students can step back to see more clearly. “Designing Life, Essentially.” The sole purpose of the class is to create space for students to design their lives. Each week it gives them a scheduled excuse to think. They are forced to turn off their laptops and smartphones and instead to turn on the full power of their minds. Think of Sir Isaac Newton. He spent two years working on what became Principia Mathematica, his famous writings on universal gravitation and the three laws of motion. This period of almost solitary confinement proved critical in what became a true breakthrough that shaped scientific thinking for the next three hundred years. Richard S. Westfall has written: “In the age of his celebrity, Newton was asked how he had discovered the law of universal gravitation. ‘By thinking on it continually’ was the reply.… What he thought on, he thought on continually, which is to say exclusively, or nearly exclusively.” In other words, Newton created space for intense concentration, and this uninterrupted space enabled him to explore the essential elements of the universe. Here’s another paradox for you: the faster and busier things get, the more we need to build thinking time into our schedule. And the noisier things get, the more we need to build quiet reflection spaces in which we can truly focus. No matter how busy you think you are, you can carve time and space to think out of your workday. Jeff Weiner, the CEO of LinkedIn, for example, schedules up to two hours of blank space on his calendar every day. He divides them into thirty-minute increments, yet he schedules nothing. It is a simple practice he developed when back-to-back meetings left him with little time to process what was going on around him. At first it felt like an indulgence, a waste of time. But eventually he found it to be his single most valuable productivity tool. He sees it as the primary way he can ensure he is in charge of his own day, instead of being at the mercy of it. Journalism is not just about regurgitating the facts but about figuring out the point. It isn’t enough to know the who, what, when, and where; you have to understand what it means. This works in life just as it does in journalism. As often happens to driven, ambitious people, his earlier success had distracted him from his clarity of purpose. The class reviewed more than 100 mission statements and noticed that some of the most grandiose were actually the least inspiring. For example, one had the mission to “eliminate hunger in the world,” but given that there were just five people in the organization, the mission felt like little more than empty words. The right “no” spoken at the right time can change the course of history. Sunk-cost bias is the tendency to continue to invest time, money, or energy into something we know is a losing proposition simply because we have already incurred, or sunk, a cost that cannot be recouped. But of course this can easily become a vicious cycle: the more we invest, the more determined we become to see it through and see our investment pay off. The more we invest in something, the harder it is to let go. This truth is demonstrated elegantly by the story of a school located next to a busy road. At first the children played only on a small swath of the playground, close to the building where the grownups could keep their eyes on them. But then someone constructed a fence around the playground. Now the children were able to play anywhere and everywhere on the playground. Their freedom, in effect, more than doubled. Similarly, when we don’t set clear boundaries in our lives we can end up imprisoned by the limits others have set for us. When we have clear boundaries, on the other hand, we are free to select from the whole area—or the whole range of options—that we have deliberately chosen to explore. When Britain discovered North Sea oil in 1980, the government suddenly had a massive windfall in additional tax revenues, to the tune of 166 billion pounds ($250 billion) over a decade. Arguments can be made for and against how this money was used. But what is beyond contestation is that it was used; instead of creating an endowment to prepare against unexpected disasters (such as, in hindsight, the coming great recession), the British government spent it in other ways. Norway also benefited enormously from windfall taxes from oil but unlike Britain, Norway invested much of its good fortune in an endowment. Today, this endowment has grown over time to be worth an extraordinary $720 billion, making it the world’s largest sovereign wealth fund and providing a cushion against unknown future scenarios. 1) What risks do we face and where? 2) What assets and populations are exposed and to what degree? 3) How vulnerable are they? 4) What financial burden do these risks place on individuals, businesses, and the government budget? 5) How best can we invest to reduce risks and strengthen economic and social resilience? 1) What risks do you face on this project? 2) What is the worst-case scenario? 3) What would the social effects of this be? 4) What would the financial impact of this be? 5) How can you invest to reduce risks or strengthen financial or social resilience? Your answer to that fifth and crucial question will point you to buffers—perhaps adding another 20% to the project’s budget, or getting a PR person on board to handle any potential negative press, or calling a board meeting to manage shareholder expectations—that you can create to safeguard you against unknowable events. What is the “slowest hiker” in your job or your life? What is the obstacle that is keeping you back from achieving what really matters to you? By systematically identifying and removing this “constraint” you’ll be able to significantly reduce the friction keeping you from executing what is essential. The Nonessentialist operates under the false logic that the more he strives, the more he will achieve, but the reality is, the more we reach for the stars, the harder it is to get ourselves off the ground. The way of the Essentialist is different. 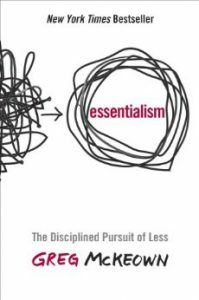 Instead of trying to accomplish it all—and all at once—and flaring out, the Essentialist starts small and celebrates progress. Instead of going for the big, flashy wins that don’t really matter, the Essentialist pursues small and simple wins in areas that are essential. My wife Anna and I have tried to apply these ideas to our system of parenting. At one point, we had become concerned with how much screen time had crept into our family. Between television, computers, tablets, and smart phones it had become just too easy for the children to waste time on nonessential entertainment. But our attempts to get them to change these habits, as you can imagine, were met with friction. The children would complain whenever we turned the TV off or tried to limit their “screen time.” And we as the parents had to consciously police the situation, which took us away from doing things that were essential. So we introduced a token system. The children were given ten tokens at the beginning of the week. These could each be traded in for either thirty minutes of screen time or fifty cents at the end of the week, adding up to $5 or five hours of screen time a week. If a child read a book for thirty minutes, he or she would earn an additional token, which could also be traded in for screen time or for money. The results were incredible: overnight, screen time went down 90 percent, reading went up by the same amount, and the overall effort we had to put into policing the system went way, way down. In other words, nonessential activity dramatically decreased and essential activity dramatically increased. Once a small amount of initial effort was invested to set up the system, it worked without friction. There is something powerful about visibly seeing progress toward a goal. Don’t be above applying the same technique to your own essential goals, at home or at work. When we start small and reward progress, we end up achieving more than when we set big, lofty, and often impossible goals. And as a bonus, the act of positively reinforcing our successes allows us to reap more enjoyment and satisfaction out of the process. For a long time I wrote in my journal only sporadically. I would put it off all day; then at night I would rationalize, “I will do it in the morning.” But inevitably I wouldn’t, and then by the next night I had two days’ worth to write and it was overwhelming. So I put it off again. And so on. Then I heard someone say he had developed a routine of writing a few lines at the exact same time each day. This seemed like a manageable habit, but I knew that I would need some cue reminding me to write at the specified time each day or I would continue to put it off as I’d been doing. So I started putting my journal in my bag right next to my phone. That way, when I pull my phone out of my bag to charge it each evening (already a well-established habit) I see the journal, and this cues me to write in it. Now it is instinctive. Natural. I look forward to it. It has been ten years now and I have almost never missed a day. The way of the Essentialist is to tune into the present. To experience life in kairos, not just chronos. To focus on the things that are truly important—not yesterday or tomorrow, but right now. When we look back on our careers and our lives, would we rather see a long laundry list of “accomplishments” that don’t really matter or just a few major accomplishments that have real meaning and significance? He uses the acronym FCS (a.k.a. FOCUS) to teach his philosophy to his employees. The letters stand for “Fewer things done better,” “Communicating the right information to the right people at the right time,” and “Speed and quality of decision making.” Indeed, this is what it means to lead essentially.